When markets are hot, Networking events are a calling card for many. In recent times, we have had numerous events surrounding investing and trading – all sold as a way to Network with fellow investors and learn the ropes from renowned speakers. With most speakers given an hour to speak, I do wonder how much can really be learnt and how much of the presentation is nothing more than an exercise that showcases multiple biases of the speaker himself. Morningstar is a renowned website that helps investors gather more information about stock and funds. 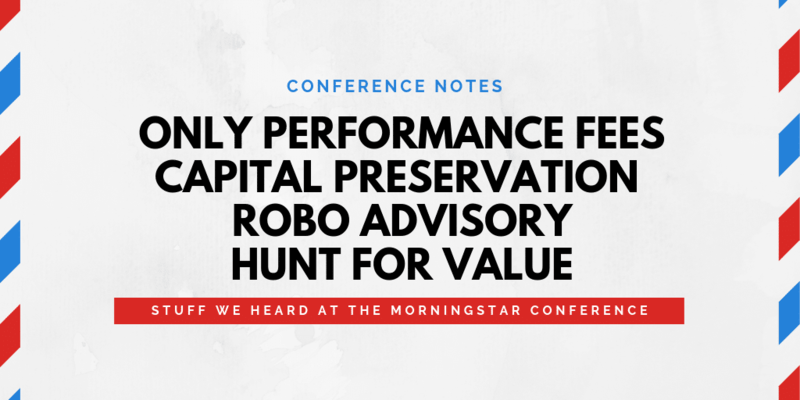 This year’s MorningStar conference was the 8th year that such an event is being held. While I personally avoid events, mostly due to the high fees surrounding them, this year I attended the Conference thanks to being provided an entry for free. The last time I attended the Morningstar Conference was in 2012 and this was the second such visit. The key reason was to listen to speakers such as Mark Mobius, Mohnish Pabrai, Bharat Shah among others. There was also a Video by John Bogle which I missed out. This post is an attempt to round-up the event based on my experience. Do note that my biases do play a large role as also my expectations which could be unduly high. The keynote address on day 1 of the 2 day event was by Mark Mobius, a very well-known name in the investment circles. Till 2015, he was the lead manager of Templeton Emerging Markets Investment Trust which he had run for 26 years since its inception in 1989. Over that period of time, the fund out-performed its benchmark, MSCI Emerging Nations fund though over the last 10 years, it had slightly under-performed against the same benchmark. Mobius believes emerging nations such as India are entering a period of high growth. He showcased slides of cities such as Shanghai, Dubai and Kuala Lumpur to showcase how much of a growth those cities have seen in the last 25 years. When selecting companies, he also talked about positively discriminating companies that qualify under the ESG model – ESG funds are portfolios of equities for which environmental, social and governance factors have been integrated into the investment process. ESG was a large topic of discussion at the event even though its yet to be seen if it’s a fad or companies can really be nudged to change based on investors actions. For a keynote speaker, my feeling of his presentation was one of disappointment. It felt more like a presentation he had prepared for pitching clients for his upcoming emerging market fund he is soliciting funds for currently. A key point he made using historical data was that Bear markets were shorter in tenure. The average emerging markets bear market ended at 7 months with the average draw-down being 34%. He believes that the Rupee will get weaker and while he wishes to invest in India, the body language seemed to be one of wait and watch to observe how the government acts. Coming to his own investment philosophy, he said that its been changing and while valuations were still important when considering companies, he also looked at the people behind the company, their culture and philosophies. In other words, he believes that company performances have a strong correlation to those who run the companies and while one invests in the company, they are really betting on the people who run the show. With the Federal Reserve on route to hike Interest rates in US higher, Mobius feels that the days of cheap money which gave rise to bubbles in bitcoins will be days of the past. That said, even post the current fall, Bitcoin (in INR) still trades at 10x what it traded just 2 years ago. Philip Straehl of Morningstar had an interesting presentation, the key point which struck me was data that indicated that over the long term, nearly 50% of growth in US Indices could be accounted by dividends and buybacks. The smallest addition was by Earnings with rest accounted by Inflation. Ajit Ranade was another speaker of note though he by not wanting to speculate on either markets or the rupee killed much of the fun. He believes that with large volumes, the offshore non-deliverable forward (NDF) market for the Indian Rupee is setting the tone for where the market sees the Rupee going in the near future. With elections around the corner, he believes that there will be some amount of fiscal indiscipline and one that adds to the current woes. He reminds the audience that the Dream Budget of Chidambaram was during the period of a Coalition government headed by Deve Gowda and India’s 1991 reforms were instituted by a government that was in the minority. Believes that the overall trend will not be changed by any change in the political equation we may come to see post the elections. Overall, I felt he set a bit of a bearish tone though he didn’t openly come out as bearish. He said NBFC’s are here to stay given that Banks may not be able to service those serviced by NBFC’s though the current pain isn’t going to go out in a hurry for one bad apple can upset the applecart. In the afternoon, there was a Panel Discussion on the Hunt for Value. To me, the surprising thing was omission of the real value investor when it came to mutual funds – Rajeev Thakkar who was in attendance as a normal attendee. Moderated by Sanjoy Bhattacharya, the panel had Neelesh Surana of Mirae, Pankaj Murarka – Founder of Renaissance Investment Managers, . Sailesh Raj Bhan, CFA who is the Deputy Chief Investment Officer of Equity Investments at Reliance Nippon Life Asset Management Limited and Sourabh Mukherjea. Of the four, Sourabh seemed the most happy, probably basking in the fact that finally after years of being wrong, his thesis on the Banking and Financial stocks is coming true. Spoke at length of how markets have continued to rise even as growth in the non-financial space has slowed down to a halt. With US raising interest rates, he believes that India will have to follow the act if it wants its currency to have any succor. While the pullback has been significant in recent weeks, he thinks its still more closer to the start than the bottom for many stocks which are still grossly over-valued though he feels that there are select opportunities that are opening up in the correct downturn. Murarka on the other hand believed that he still doesn’t think we are entering a bear market and this is at best a cyclical correction of the excesses. Murarka had an interesting theory regarding the impact of oil on India. He said that 10 years ago (hope I am remembering correctly), total oil imports were closer to 10% of India’s GDP. Today, its 5% of India’s GDP and going forward another 10 years in the future, it may not be as important as its perceived today. The next panel discussion was on the future of financial advisors. One key data point, India has just around 1000 RIA’s of which less than 500 are active and of whom, less than 100 are Fee Based. On the other hand, we have more than 50,000 active distributors of mutual funds. Kunal Bajaj who founded Clearfunds which was recently acquired by MobiKwik talked about how technology will be the game changer with PayTM, MobiKwik, Zerodha Coin among others being able to provide direct mutual funds without charging a fee at the tap of a button on the mobiles to millions of their users. While Robo Advisory is yet to get a foothold in India, the talk centred about how things have changed in the US where 60% of investments are now through Robo advisory. While advisors will have a place, the question is whether the current model will continue or it will be more like the US where even Vanguard offers advisors but not someone you personally know like how it’s in India currently. The biggest issue with fee based advisory is the fact that most people, Indians and elsewhere aren’t easily willing to pay up even when it can be shown to derive value. It’s a behavioural issue that cannot be easily addressed. Digital Disruption is here to stay – advisors need to embrace them & try to go for a hybrid model was one of the suggestions given to the room full of IFA’s and Distributors whose main source of income is under tremendous threat. The final talks of the day were given by Bharat Shah, the famed Value Investor and Nimesh Chandan who currently is the head of equities at Canara Robeco. Bharat Shah started off by talking about Preservation of Capital and how it can be achieved by focussing on Quality of Management, Quality of the Business and Quality of the Numbers. Quality of Growth rather than Quantum of Growth should be a key factor he reasoned. When faced with two business to invest in, one which is complex and another which is simple to understand, always opt for the latter. Complexity can have risk of unknowns while Simple businesses provide more transparency. Quality of Growth leads to Cash flow or Economic Value which in turn leads to Growth in the value of the Business. The key to success is the ability to understand the Value of a Business, the Discipline to bet on a business and the Wisdom to stay with it for a long duration. It’s any-day better, he reasons, to buy Quality at as good a price as you can get versus buying Rubbish even if its cheap. Nimesh talked about the Sources of Alpha as Information Edge, Behavior Edge and Analytical Edge. He says that its important to collect and understand cycles, something even Howard Marks recently was quoted as saying. Markets mean revert all the time and the key to success is understanding the same. He recommended checking out the book, Black Box Thinking: The Surprising Truth About Success by Matthew Syed to learn more about Failures. The key takeaway for me was his view on fees. He charges fee only on performance. When asked whether this could lead to fund managers trying to swing for the fences, he opined that one needs to take in account the quality of the manager as also whether he is co-invested. In his own funds, Pabrai is the largest investor and says that if things don’t go as planned – he has a very concentrated portfolio with minimum bet size being 10% of the funds, he also loses along with the client and this ensures that he wouldn’t take nonsensical risks. I missed out on the video of Bogle and other presentations were in my opinion, nothing out of the ordinary. All in all, it was a good time spent.